This sneaker was dropped from Nike Sportswear's recent Deluxe Safari set of retros. 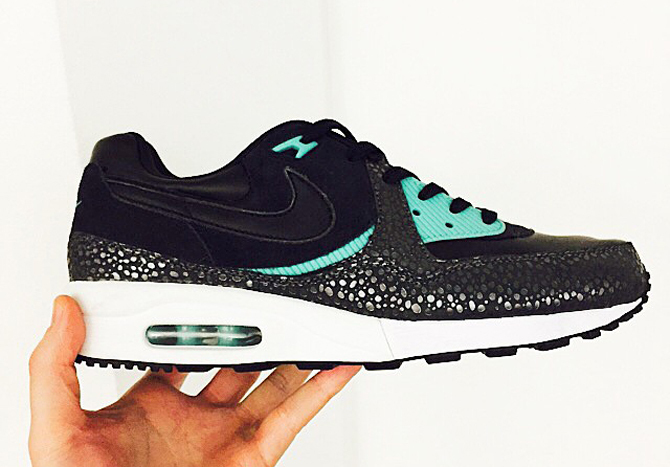 Remember the recent Deluxe "Safari" offerings from Nike Sportswear? Included in that pack were retro hits like the Nike Air Huarache Light, the Nike Air Max 90, and the Nike Air Max 1, but there was at least one pair left on the cutting room floor. That pair is the Nike Air Max Light shown here, which wears a similarly stealthy palette across its upper to go with the "Safari" dots. The AM Light has been down the "Safari" road before though - during Size? 's most prolific period with the shoe they had a couple Safari-Swooshed versions - so that's an alternative for those who might think this a must-have combo.